Bio-inspired chemistry is an attractive approach to design organic (nano)materials with tailored properties for novel types of coatings, biosensors, delivery systems, etc. 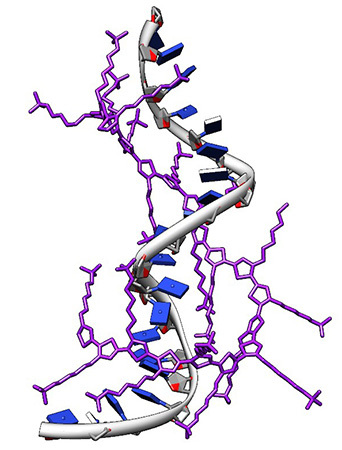 Model of chiral complexation between a cationic polythiophene (purple) and ssDNA (gray ribbon, bases in blue). 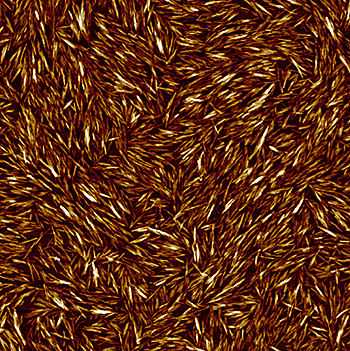 5 µm x 5 µm PeakForce Tapping topographic image of cellulose nanowhiskers. On the Mechanism of Dynamic Polymerization viaRecycled ss-DNA Templated Assembly of Non-Natural Bases. J. Lin, M. Surin, D. Beljonne, X. Lou, J.L.J. van Dongen, A.P.H.J. Schenning. Chemical Science 3 (2012) 2372-2376. Chirality in DNA-? Conjugated Polymer Supramolecular Structures: Insights into the Self-Assembly. J.Rubio-Magnieto, A. Thomas, S. Richeter, A. Mehdi, Ph.Dubois, R. Lazzaroni, S. Clément, M. Surin. Chemical Communications 49 (2013) 5483- 5485. What Are the Parameters Controlling Inter-vs. Intra-Strand DNA Photodamage with Ru-TAP Oligonucleotides? S. Le Gac, M. Surin, E. Defrancq, C. Moucheron, A. Kirsch – De Mesmaeker. European Journal of Inorganic Chemistry (2013) 208–216. Chemical Force Microscopy of Stimuli-Responsive Adhesive Copolymers. A. Beaussart, T. Chinh Ngo, S. Derclaye, R. Kalinova, R. Mincheva, Ph. Dubois, Ph. Leclère, Y.F. Dufrêne. Nanoscale, 6 (2014), 565 – 571. Modification of the Adhesive Properties of Silicone based-Coatings by Block Copolymers. T. C. Ngo, R. Kalinova, D. Cossement, E. Hennebert, R. Mincheva, R. Snyders, P. Flammang, Ph. Dubois, R. Lazzaroni, and Ph. Leclère. Langmuir, 30 (2014), 358 – 368.